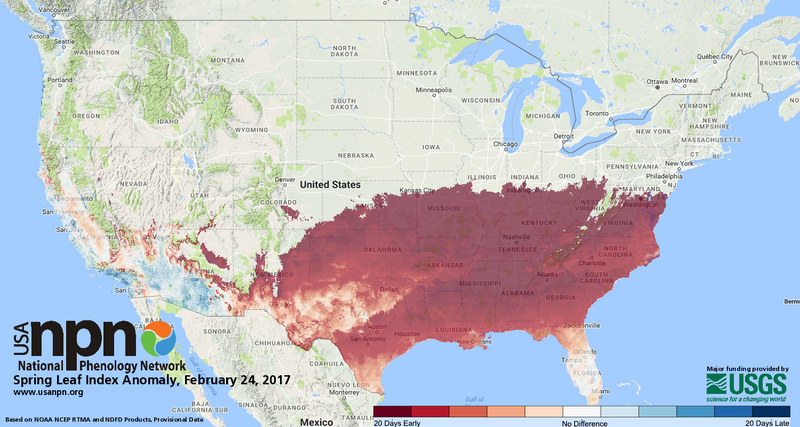 A new set of maps produced by the USGS-led US National Phenology Network (US-NPN) demonstrates just how ahead of schedule spring is across much of the continental United States. 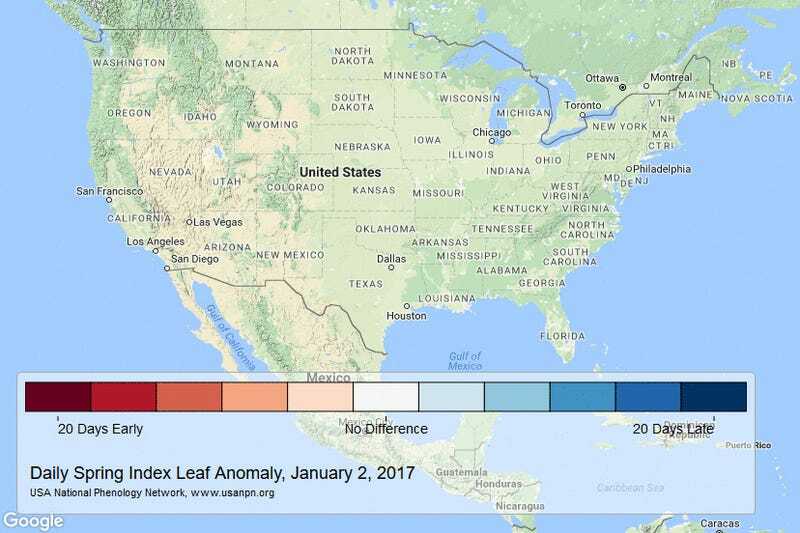 Temperature-sensitive plants have started to become active earlier than normal, sprouting leaves and flowers in coastal California and southern Nevada through to the southern Great Plains and the Atlantic Coast. In Washington, DC, spring arrived 22 days earlier than historical norms, as indicated by data on leaf-outs and flowering. These findings are consistent with the fact that the instrumental record shows that 2016 was the hottest year ever recorded for the globe, and that it was the third record-breaking year in a row. Researchers have noted that 16 of the 17 hottest years recorded occurred since 2000. These new maps show that 2017, at least so far, is shaping up to be another warm one, but also that different regions exhibit variable responses over time. To build the maps, the US-NPN researchers looked at climate change models known as “Spring Indices.” These models are based on field observations indicating that enough heat exists in a region to trigger leafing and blooming in lilacs and honeysuckles—two common and temperature-sensitive flowering plants. The warm temperatures act as a signal to the plants, telling them that spring has arrived and that it’s time to sprout leaves and flowers. This year, these signals have started to appear by as much as 10 to 22 days earlier than normal. The US-NPN also collected recent heat and temperature data provided by the NOAA, including daily data used for the National Weather Service, and historical daily data collected by Oregon State University. All this data was adjusted to conform to a daily schedule, and across a two-mile resolution. Armed with the Spring Indices and the historical weather data, the researchers were able to create day-by-day national-scale maps showing leaf emergence for these plant species. For historical context, these maps were compared against archival data, showing how different 2017 is compared to the long-term average. “While these earlier springs might not seem like a big deal—and who among us doesn’t appreciate a balmy day or a break in dreary winter weather—it poses significant challenges for planning and managing important issues that affect our economy and our society,” noted Jake Weltzin, a USGS ecologist and the executive director of the USA-NPN, in a press release. Indeed, an abnormally early spring comes at a price, affecting human health and fragile ecosystems. From an environmental perspective, a longer growing season can increase yield for certain crops, but there’s still the risk of frost to consider. Early blooming flowers can also disrupt wildlife, throwing the timing of birds, bees, and butterflies off balance. Plants are now sprouting their flowers, but their pollinators may be nowhere to be found, or in small numbers. That’s bad for plants, which need pollinators to reproduce, and for the pollinators, who are sustained by the flowers. Sadly, global warming is happening faster than these creatures can adapt. For those of you living in areas where spring has sprung, be sure to enjoy the unseasonably warm weather—but don’t forget about the costs.